Once the only has been fabricated in our professional dental laboratory, the material will be permanently applied to the tooth surface. Onlays are a good option for those who want to conservatively restore teeth that have suffered any type of decay or trauma, or even for restoring faulty fillings. Onlays make an excellent option to crowns since less tooth material is removed. The main difference between an inlay and an onlay is that onlays help restore chewing cusps that may have been damaged. While considered a long-term fixture, onlays may need restorative work or replacement in the future due to normal wear. 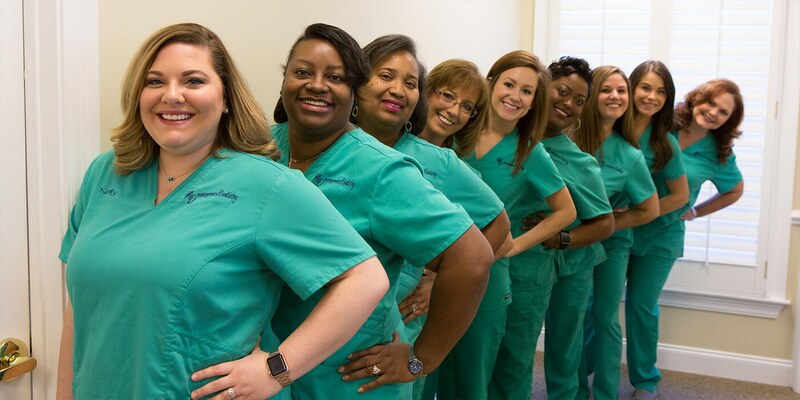 The onlay process at Montgomery Dentistry typically takes two appointments for completion. The first appointment will involve our team making molds of your teeth. These molds are the source for developing your custom onlay, and allow us to make a temporary restoration for you until the onlay is placed. After your dentist has numbed the tooth receiving treatment, any residual fillings and decayed material will be removed from the tooth. The tooth will be carefully cleaned and shaped for the onlay placement. It is during this time that a type of temporary filling will be applied to your tooth while your onlay is being fabricated in our professional dental laboratory. During your second appointment, the new onlay will be carefully applied to the space currently protected by the temporary filling. All additional adjustments will be made during this appointment and the onlay will be permanently cemented in place. As part of our normal procedure, our staff will go over instructions with you for long-term care of your new onlay.